Research shows that calendar date has a greater impact on yield than soil temperature. 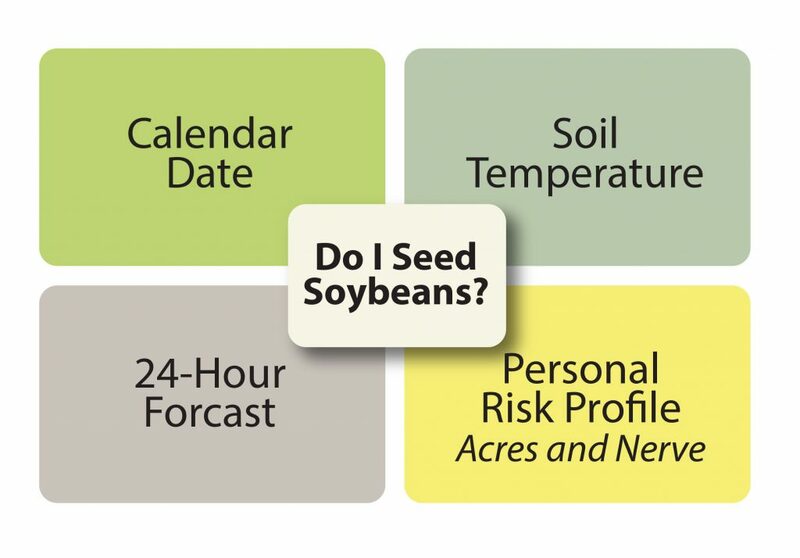 The four factors to consider when making soybean seeding date decisions. Courtesy of Cassandra Tkachuk. One study helped change official recommendations for soybean planting dates in Manitoba. Between 2014 and 2015, Yvonne Lawley, a University of Manitoba cropping systems researcher, and her then-graduate student, Cassandra Tkachuk, tested six different seeding dates based on soil temperatures ranging from six to 16 degrees. Western Grains Research Foundation and Growing Forward 2 funded the project. Contrary to expectations, they found that beans seeded earlier saw higher yields regardless of soil temperature. They concluded that calendar date had a greater impact on yield than soil temperature. These results challenged an old paradigm: beans are traditionally seeded when soils reach about 10 C, which typically happens around the end of May. Not that recommendations have changed radically: Tkachuk, who now works as a production specialist for Manitoba Pulse and Soybean Growers, says producers are still encouraged to take soil temperature into consideration. A new study at University of Manitoba will shed more light on this subject. Kristen MacMillan is an applied soybean and pulse research agronomist in the department of plant science. In 2017, she began a two-year study funded by Manitoba Pulse and Soybean Growers that will build on Tkachuk’s work. 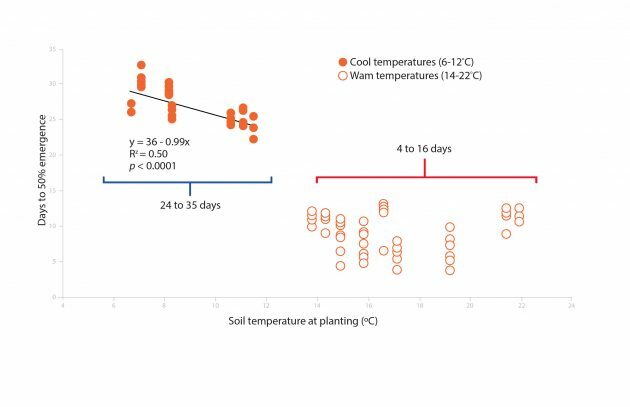 The relationship between days to 50 per cent emergence and soil temperature for three combined site years in Cassandra Tkachuk’s study. Source: Tkachuk, C. 2017. Evaluation of soybean planting dates and plant densities in the northern growing regions of the Northern Great Plains. M.Sc. Thesis. University of Manitoba. Tkachuk’s project was run on two sites in southern Manitoba. MacMillan’s study expands to four sites: Carman, Melita, Arborg and Dauphin. “The initial work was done in Carman and Morden, which are located in the long season area of Manitoba, so in order for us to have more confidence in seeding date recommendations we wanted to expand outside that traditional soybean growing region,” MacMillan explains. The new study will look at four seeding windows of five to 10 days each over a roughly six-week period. The first window is very early, roughly the last week of April into the first week of May, or as soon as producers can get into the field, says MacMillan. The second window is May 6 to 14 and the third window falls during the time producers traditionally seed soybeans, around May 16 to 23. The final window is the last week of May to the first week of June. Two varieties are being tested at the four seeding windows at each of the sites: a short-season soybean variety and a longer season soybean variety. MacMillan says the study was originally planned to run for two years, concluding in 2018, but very dry conditions over both years of the study have prompted her to consider adding a third year in hopes of more “normal” conditions in 2019. Data from 2018 hasn’t yet been analyzed, but 2017 results show that the first three seeding dates had a statistically similar yield, which suggests that while there was no penalty or advantage to early seeding, there is a longer window for seeding soybeans than was originally expected. “We didn’t see an advantage to the earliest seeding date, but we’ll see if that trend continues in 2018. We did see a 15 to 20 per cent yield drop with that late season seeding date, when we seeded in the last few days of May and into June,” she says. According to MacMillan, the original study was prompted by farmers’ experience; they were already moving toward earlier seeding with some success. She hopes to gain a better understanding of whether and how soybean yield responds to seeding date and if that response is consistent across environments. Lawley says that though there are tradeoffs in terms of slower emergence, seeding earlier in the year helps spread out planting dates. “What I think will happen in the Red River Valley is that we’ll see more problems with root rots and early season soil borne diseases in time, so stand establishment may become more important for us. But at this point the biggest constraint on us is the length of the growing season,” she says. Soil temperature and seeding date are intertwined with the risk of frost, Lawley adds, so producers are taking on extra risk when they seed earlier in the year or into colder soil temperatures. “The farmer is trading off the chance of reward with the risk of reseeding in the spring,” she says. But she wants farmers to consider not just soil temperature but the other factors involved in the decision: seeding date, weather and personal risk. “Ultimately it’s a strategy – you don’t want to plant everything to one variety on one day, you want to takes steps to plant over a range of dates,” she says. There are other strategies producers can use to get soybeans in the ground earlier. Lawley points to her work with residue management using strip tillage before seeding soybeans to highlight the fact that there are ways of providing soil cover that help warm soils up earlier in the year. “This is a complicated story but the simple part is that we can manage residue to influence soil temperature,” she says.